Can't hold back the tears. 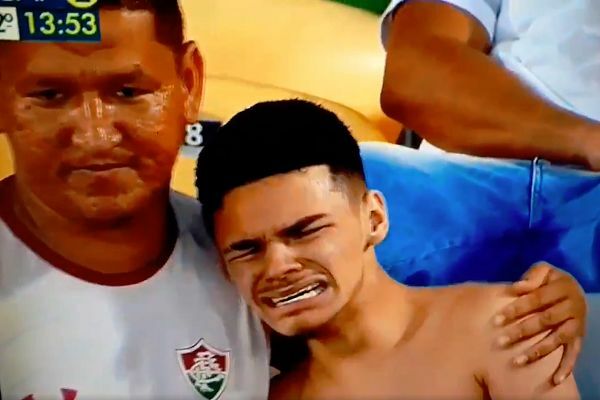 A shirtless Fluminense supporter couldn’t hold back the tears as his team were knocked out of the Copa Sudamericana by Atlético Paranaense on Wednesday. Having lost the first leg 2-0, Fluminense went down by the same score at the Maracanã as Paranaense booked a final date with Colombian side Atlético Junior. They also exacted revenge for their 1-0 defeat to Fluminense in the final of the 2016 Primeira Liga, a competition contested by teams from Brazil’s South Region, Minas Gerais and Rio de Janeiro. Aside from that regional success, it’s been a miserable few years for Fluminense since winning the Campeonato Brasileiro Série A title in 2012. They lie 14th in this season’s table with just one game remaining, which is the same position they ended up in last year. The two seasons before that brought back-to-back 13th place finishes, so it’s been a spell of prolonged mediocrity for a club that counts Ronaldinho, Romário and Carlos Alberto among its former players.